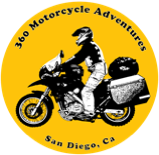 360 Motorcycle Adventures offers a variety of touring and adventure motorcycle guided tours to fit your time frame, deserved scenery and budget. Each one of the tours have there own characteristics, beauties and chalenges. Discovery Baja by motorcycle is the best way to appreciate this place. Baja is famous for the off-road races, like Baja 1000 and Baja 500, but they also have an amazing cuisine, excelent wines and the best fish in México. Whitout forget the incredible whale watching tours, beatutiful beaches and miles and miles of gravel roads to be conquered. All this combined makes Baja California a premier destination for adventure riders, off-road enthusiasts and bikers that want to know and experience the desert solitud and the open road.